"3LA1, V-2012" by Timothy K. Perttula and Robert Z. Selden Jr. CONTEXT INFORMATION: From a grave (Burial 1) in Burial Plot 3 (Martin 1939). Associated with V-2007 to V-2011 and V-2013 in the grave. DECORATION: The rim has a horizontal interlocking engraved scroll that is repeated twice around the vessel. There are also single rows of tool punctates along the rim and at the vessel carination. The horizontal interlocking scroll has a central hatched band with two upper and lower hatched brackets that extend either to the rim or the vessel carination. Between the upper and lower set of brackets are single horizontally-oriented engraved rectangles. The remainder of the scroll motif consists of upper and lower single hooked arm engraved lines. The two scrolls are divided by two sets of vertical engraved and hatched brackets that extend from the rim to the vessel carination. Between them is a single vertically-oriented engraved rectangle. 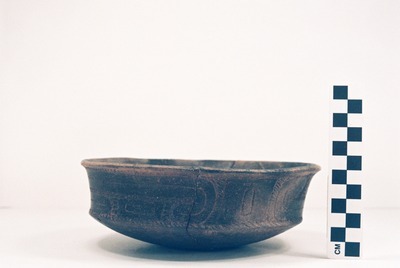 Handy Engraved carinated bowl (5425-733).